Easels, drafting tables and at least one piano. Those were the everyday elements of life if your father was an artist and your mother was a classical soprano. My father was the creator of The Jackson Twins comic strip. It was based on twin teenage girls and everything I ever did that was bad, yet printable, ended up in that comic strip! Years later I became his assistant for the last six years the strip was syndicated. My father had a 2nd career as a painter of historical marine scenes. He specialized in the Connecticut River Valley and scenes of New York north to Boston. He was from the art meccas of Rockport and Gloucester, MA and was well versed in painting the winds and waters of New England. As a young artist I had the opportunity to study privately with many of his original instructors who were willing to take me on. We lived in Europe in the late 60’s and I am a graduate of The American School in Switzerland, Lugano. Art was everywhere in my life, and it was only natural that I would focus my future on painting. My goal is to take reality and make it personal. I want the viewer to feel welcomed into the scenes I choose to paint. The Inspiration of the Southwest lies just outside my studio door in Carefree, AZ. I have a beautiful variety of landscapes on my own property and within an easy drive. Living in Europe made me adaptable and I am very at home painting the moods of Tuscany and Provence. The California coastline and New England are also favorite locations. These plein air paintings are throughout my new collections. My commitment as an artist translates into painting nearly every day of the week. My popular Come Paint With Me© private painting lessons focus on showing others how to express themselves in oils. 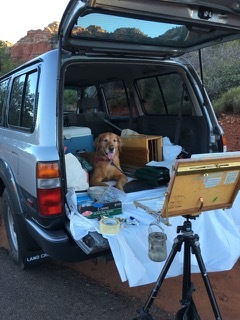 Virginia painting en plein air on the Carefree nature preserve behind her home. Life is inevitably filled with twists and turns. These challenges leave us with a choice. After a difficult period in my life, I made a conscious decision to create a feeling of calm in my world. Peacefulness began to show up in everything I painted. I was not aware of these changes until long-time collectors started asking me where these quiet scenes were originating from. With a new realization of this gift I opened the door to redesigning my future as an artist.